We look forward to seeing you on Tuesday 8th January 12-2pm and Thursday 10th January 2-4pm. On the Twelfth Day of Christmas, My True Love Gave to Me… Apps! Over the last two weeks of term we’ve been running our very own Twelve Days of Christmas countdown in a 21st century style by highlighting some of the great free apps that you can download onto your phone or tablet. Ranging from the academic to the irreverent, the helpful to the funny, we hope there’s something to tickle your Christmas fancy. The complete rundown is on our Twitter and Instagram feeds (if you’re not following us already, please do, we’d love to hear from you!) 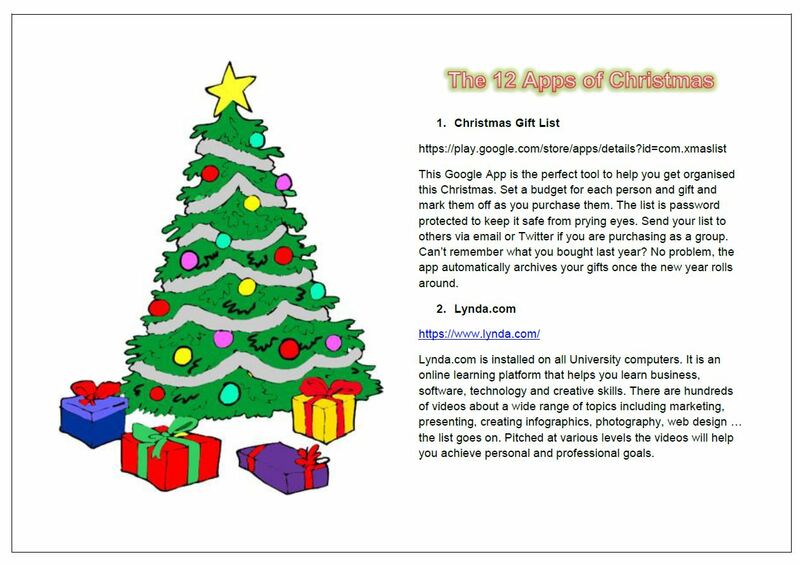 and can also be viewed complete in PDF form via this link: 12 Apps of Christmas. From all of us to all of you going home for the vacation this weekend, we wish you safe journeys and hope you have a very Merry Christmas, and look forward to seeing you all in 2019. Cheers! Loughborough University is partnering with The Times and Sunday Times to offer all students a complimentary subscription to the newspaper’s digital content. For the next 12 months, students will have digital access to The Times website and its smartphone and tablet apps. The newspaper will also be hosting a series of exclusive events over the next year featuring its journalists and key political figures. To start your subscription, simply follow the instructions you will have been sent to your student email. As librarians, we tend to agree with Groucho Marx’s oft-quoted remark about the medium of television – even in the digital age, we still love a good book – but there is no denying that television is still one of the world’s biggest phenomenons – and is likely to remain so for long years ahead. And so it was in 1996 that the United Nations General Assembly proclaimed 21st November as World Television Day, in recognition of the increasing impact television has on decision-making by bringing world attention to conflicts and threats to peace and security and its potential role in sharpening the focus on other major issues, including economic and social issues. 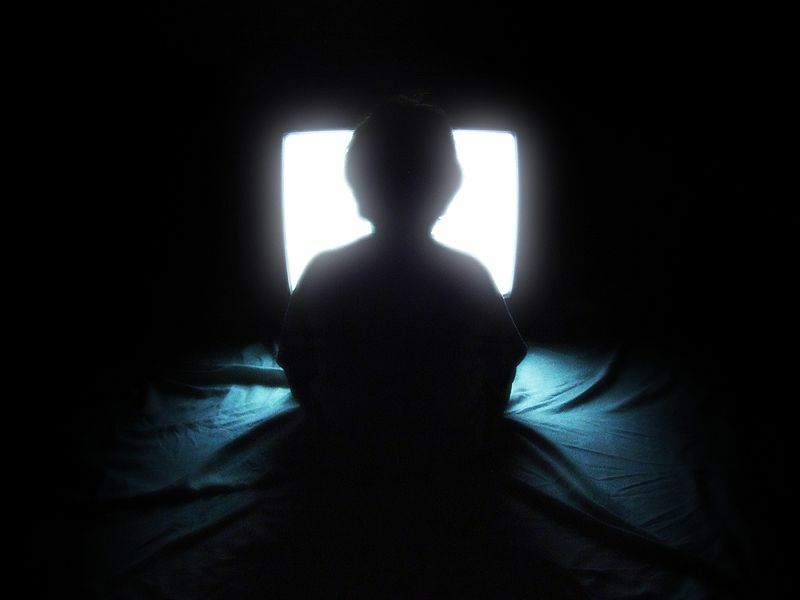 It is not so much a celebration of television as a communication tool, but as a symbol for communication and globalisation in the contemporary world. We hold a huge range of books about every aspect of the medium among our collection, from historic studies to the nuts-and-bolts of television engineering and broadcasting. We also provide access to a number of very popular online resources all about television, most notably Box of Broadcasts (BoB), from which you can not only catch up with the latest episodes of your favourite shows, but also easily create your own clips from TV programmes, and create useful playlists of clips to refer to at a later date for further study or research. And if you’re more interested in more vintage television, try dipping into the British Film Institute’s archives in BFI Screenonline, where you can watch old episodes of classics like Doctor Who, Fawlty Towers, and even University Challenge! One of the most iconic characters of modern times celebrates their 90th birthday this very day – the one and only Mickey Mouse! Created by Walt Disney and Ub Iwerks in 1928 for Steamboat Willie, one of the Disney Studios’ earliest sound animations, the character has gone on to appear in over 130 films and countless spin-offs in every conceivable medium – and became the figurehead of the Disney phenomenon. Walt Disney himself acknowledged the debt his studio owed to the lovable cartoon rodent – “it was all started by a mouse”, he declared in an interview in 1954! We have a wide range of books about Walt Disney, his films and Mickey Mouse among our art and cinema books on Level 2. 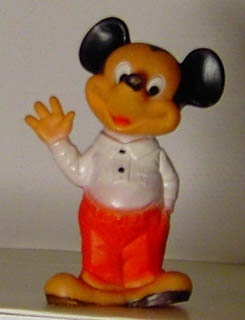 You can also explore more about the history and influence of Disney (and Mickey!) at the British Film Institute website and our online art databases including Art Retrospective and Art & Architecture Source. Interested in fashion, either for your studies or just in general? Then settle down and treat yourself to a browse through the archives of the world’s foremost fashion magazine, Vogue. 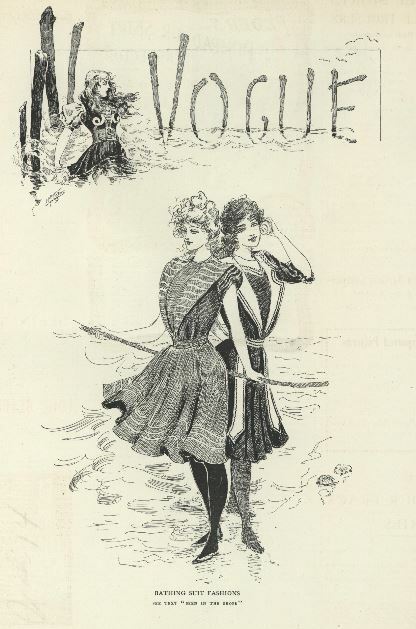 The Vogue Archive contains the entire run of Vogue magazine (US edition), from the first issue in 1892 to the current month, reproduced in high-resolution color page images. Every page, advertisement, cover and fold-out has been included, with rich indexing enabling you to find images by garment type, designer and brand names. The Vogue Archive preserves the work of the world’s greatest fashion designers, stylists and photographers and is a unique record of American and international fashion, culture and society from the dawn of the modern era to the present day. In addition to the editorial content, all covers, advertisements and pictorial features have been captured as separate documents to allow for searching and discovery. For advertisements, the featured company and brand names have been assigned to the document records, and all image captions are captured to a high accuracy, allowing accurate retrieval of photographs and illustrations. Contributor names that appear in image credits, such as photographers, stylists and illustrators, are also indexed. You can also limit your search by journal editor, and specialist indexing of full-page images from photo features. There are separate designated fields for Fashion Items, Trends, Colour and Prints. The Vogue Archive is available through Library Catalogue Plus and seperately via Proquest here. 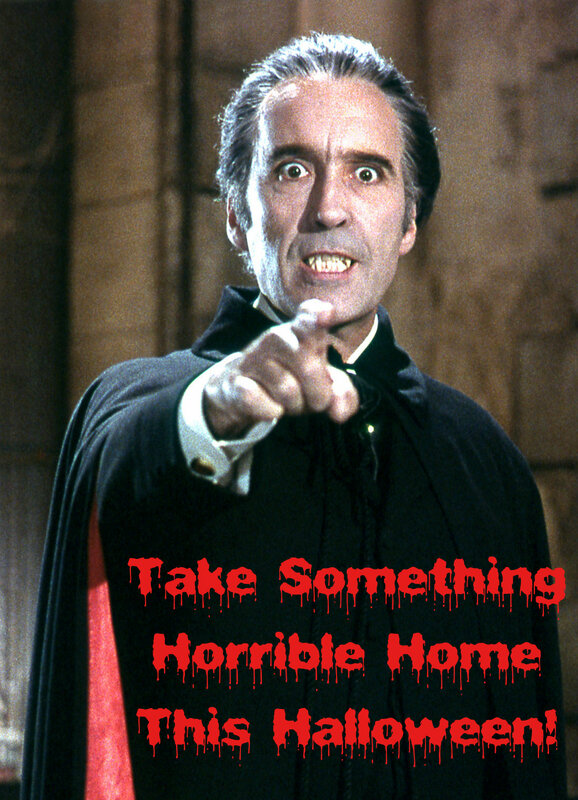 Take Something Horrible Home This Halloween! Trick or treating not your thing? Then why not experience the spooky season from the comfort of your armchair by taking a dip into our very own Twilight Zone of horror & the supernatural here in the Library… if you dare! We have an ever-expanding stock of horror novels among our Leisure Reading collection upstairs on Level 4, including Stephen King, Neil Gaiman and Iain Banks, as well as graphic novels such as Alan Moore’s From Hell and the first book in the ever-popular Walking Dead series, as well as a wide selection of more classic spine-chillers downstairs in our literature section on Level 2 including Bram Stoker’s Dracula, Mary Shelley’s Frankenstein, and a wide range of classic supernatural tales by M.R. James, H.P. Lovecraft and Algernon Blackwood. If your taste for the macabre is more visual than textual, then we have a comprehensive selection of books exploring every aspect of the horror genre on the big (and small) screen among our cinema & television collection down in the 791 section on Level 2, ranging from Alfred Hitchcock to Hannibal Lecter and Dr Jekyll to Dr Who. Don’t forget that you can also explore the cobwebbed vaults of the British Film Institute and Box of Broadcasts (BoB) online if you’re looking for something creepy to watch… just don’t watch it alone! Boldly going where no one has gone before, it’s World Space Week, the annual celebration of mankind’s exploration of outer space. 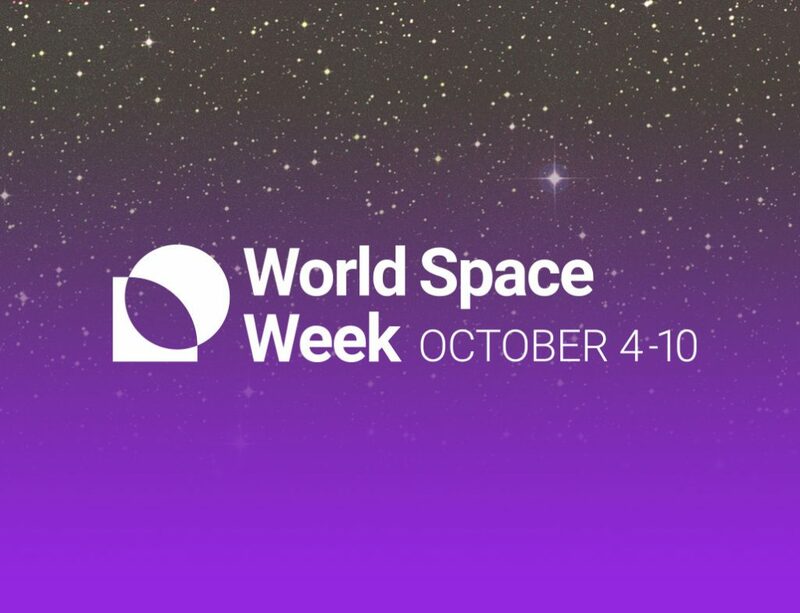 Each year, the World Space Week Association (WSWA) selects a theme for the upcoming World Space Week (WSW) to provide a focus of the activities and events that take a place throughout the world, during 4th-10th October . The 2018 theme is Space Unites the World, which celebrates the role of space in bringing the world closer together. The theme is inspired by UNISPACE+50, an historic gathering of world space leaders which will occur in 2018. UNISPACE+50 will promote cooperation between spacefaring and emerging space nations and help space exploration activities become open and inclusive on a global scale. Launched specifically on 4th October by the UN General Assembly to mark the successful launch of Sputnik 1, the first man-made satellite, in 1957, and the signing of the ‘Treaty on Principles Governing the Activities of States in the Exploration and Peaceful Uses of Outer Space, including the Moon and Other Celestial Bodies’ on October 10th 1967, World Space Week has been held every year since 1999, and seeks primarily to educate people about the positives of space exploration and encourage better public understanding and support for space programmes. We have many and various astronomical and astronautic resources in the Library, including access to the National Geophysical Data Centre database, which provides the latest satellite geophysical data from the Sun to the Earth and Earth’s sea floor and solid earth environment, including Earth observations from space, and the NASA Scientific & Technical Information database, which includes up-to-date information about NASA’s space projects. We also hold a good selection of books about space & space exploration in general. Want to keep track of the latest IT developments across campus, as well as news about software and hardware upgrades? 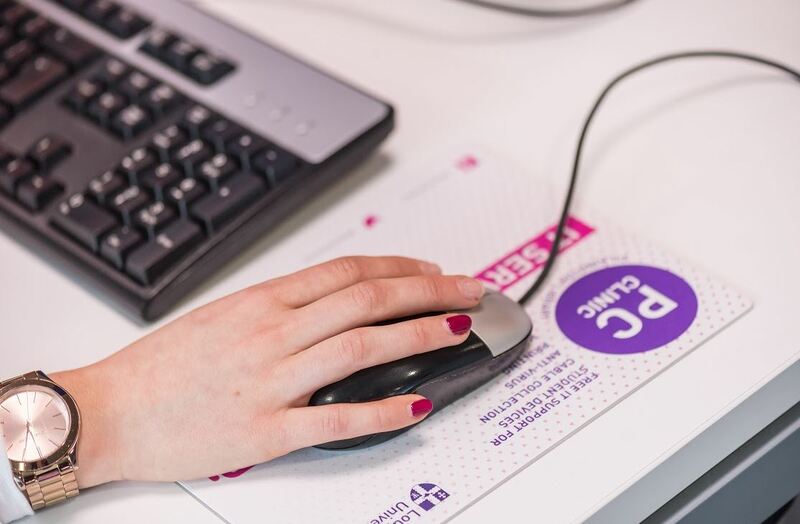 Self-Enrol onto the PC Clinic and Software Downloads Module page on LEARN. The PC Clinic page features essential information while highlighting the key IT services available to students such as printing and computer lab availability. Including tutorials for Printing and connecting devices to the Wi-FI. The Software Downloads page features download links to a range of different software with FREE access to Microsoft Office 2016 also, including specialist software such as MatLab and SPSS. We’ve recently added a new resource to the Digimap stable, our popular geographic database. An easy to use interface to allow you to browse, annotate and print global maps. A data download facility to providing access to global datasets for use in GIS software. Please note that as this is a new service and still in development it is subject to change and may be unavailable while Digimap works on it. Visit https://digimap.edina.ac.uk/global to find out more.